Creative Nightscapes offers quality outdoor lighting design and installation services to residential and commercial customers. Owner Patrick Cheatham started the company in 2004, and we have completed more than 4,300 projects over the years since then. Creative Nightscapes, located in North Richland Hills, now has more than a dozen employees who provide dependable design and installation to enhance home and office exteriors and properties. At Creative Nightscapes, we maintain the lighting systems we install, and we never outsource work to subcontractors. Our company is a member of the Better Business Bureau and the Association of Outdoor Lighting Professionals. Customers in North Richland Hills who have used our services have mentioned how satisfied they were with their lighting systems and how professional our team was before, during, and after work was completed. Our landscape lighting services provide our customers with a way to enhance their property and call attention to certain features. Our team can come up with the right design for your property and handle the installation process. Whether you want garden lights, well lights, downlights, or a combination of different landscape lights, we can help you determine the most suitable design for your home or business. LED lighting offers a more energy-efficient way to illuminate your home or office exterior and property. These LED lights use low voltage and last longer than other bulbs while also using less electricity overall. Our team at Creative Nightscapes provides design and installation services for LED lighting in North Richland Hills. Outdoor lighting can do more than enhance your home or office’s appearance. This lighting can also keep the premises safe by deterring intruders and providing plenty of light to see by for residents or employees. 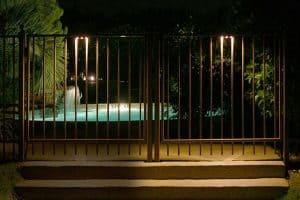 At Creative Nightscapes, we offer high-quality security lighting for residential and commercial customers. Having outdoor patio lighting can help you and your family get more use out of this part of your property. Patio lights can create a certain ambiance for this area while also giving you illumination for safety. Creative Nightscapes has a team of professionals available to assist you with patio lighting design and installation in NRH. Poolside lights can make it possible for you to use your pool more often during the summer. These lights offer a safer swimming environment, and they can also be designed to create a serene atmosphere. Creative Nightscapes can help you come up with the perfect poolside lighting design, and our team will install your new lights for you. When you have certain features that you want to draw attention to in your garden, Creative Nightscapes can help. 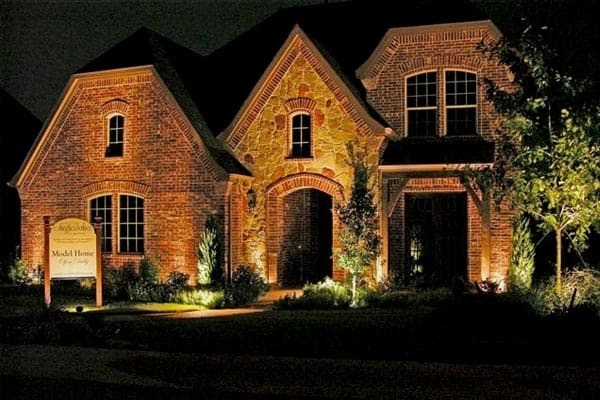 Our garden lighting design and installation services in North Richland Hills can provide this part of your property with the right illumination. These lights can also make garden paths safer to walk on when it’s dark. If you’re looking for more information on our outdoor lighting services in North Richland Hills, please contact Creative Nightscapes today. We also offer services in surrounding cities, including Bedford, Colleyville, Hurst, Keller, and Southlake. We really enjoyed working with Creative Nightscapes. They listened to what we wanted and provided excellent ideas! We love everything they did and all of the attention to the little details. Installed Kichler LED outdoor landscape lighting at home in Forest Glenn East. Mounted down lights in eaves to illuminate patio and grill areas in back yard. Placed wash lights and up lights to accent Crepe Myrtles, Holly trees, Palm trees, Magnolia tree, and other landscape greenery. Installed LED uplights and downlights at residence in Grace Meadows to accent exterior of home and illuminate driveway. Performed semi-annual maintenance for residential client in North Richland Hills; cleaned and tested all Garden Light fixtures, replaced two MR-16 halogen bulbs and one socket. Spoke to client about pool landscape lighting system.